Skin Care with Ross: Ross' Product Pick of the Week! Ross' Product Pick of the Week! This week's product pick is a cult favorite among the skin care gurus! 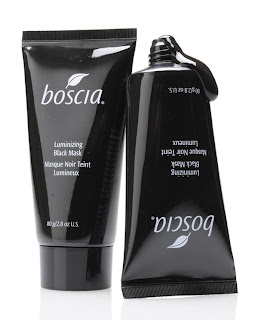 This peel-off facial mask by Boscia literally looks and feels like tar BUT works wonders!! The formula includes potent Vitamin C to brighten and even out skin tone, some interesting but beneficial plant extracts, and the astringent witch hazel water. Witch hazel contains great antioxidants but it can have irritating properties...that being said, a product like this is only used weekly so the witch hazel is not a concern of mine. What makes this mask special is the clay it contains. It is based with Calcium Montmorillonite Clay which contains 67 minerals and helps remove excess dirt and oil from your skin. Ignore the "detox" claims, thats just a gimmick! It really does come off in one sheet! Just pull slowly. How to use it: I apply this mask to a clean, freshly shaved face. When spreading the product, a thick layer is not need but it IS important to apply the product evenly! This way the product peels off in one whole piece. Also, avoid hair such as your eyebrows and hairline, any hair that gets stuck in the mask will be pulled on during the peel-off process, that can be painful! Allow the product to dry on your skin for about 20-30 minutes then peel away! It may feel like pulling off a band-aid at times, but that helps remove all the dead skin cells to reveal a brighter complexion! Any piece of the mask that doesn't peel off can be easily removed with a damp washcloth. I do not recommend using this mask more than once a week! Is this good for all skin care for men? Back on track with Music Monday & a new video!